This module will help students to understand and interact effectively with regard to the organizations that they engage with or depend on for important life goals. Students will be encouraged to think strategically about how organizations can use technology to catalyze constructive, innovative, and mission-driven practices. Further, students will gain insight into the data gathered and practices used to spur change in stagnant organizations. Through various engagement practices and a capstone experience that includes an internship, students completing this module will become accomplished in using organizational forms, data, and technology to communicate in a variety of organizational domains. Students will increase their ability to understand the organizations with which they are involved. 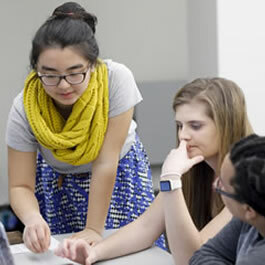 Students will engage in critical thinking about organizational innovation and technology. Students will apply strategic communication methods in their module courses and their capstone internship experience. Students will gain better insight into challenges involved in both managing and being managed within an organization. Students will put into practice principles and/or methods for the analysis of organizations and for making recommendations for change.